The Oyster River Volunteer Fire Rescue Association (ORVFRA) has purchased some new equipment to aid in their fire rescue activities. The Association has utilized funds received from the 2017 and 2018 summer-time deployments when Oyster River Fire Rescue was called to help fight forest fires in other parts of the province. Two practical and reliable purchases were made which include a 2018 Ford F-350 to be used as a duty officer truck. It replaces an outdated oversized F-550 to allow for better maneuverability and rescue scene access. 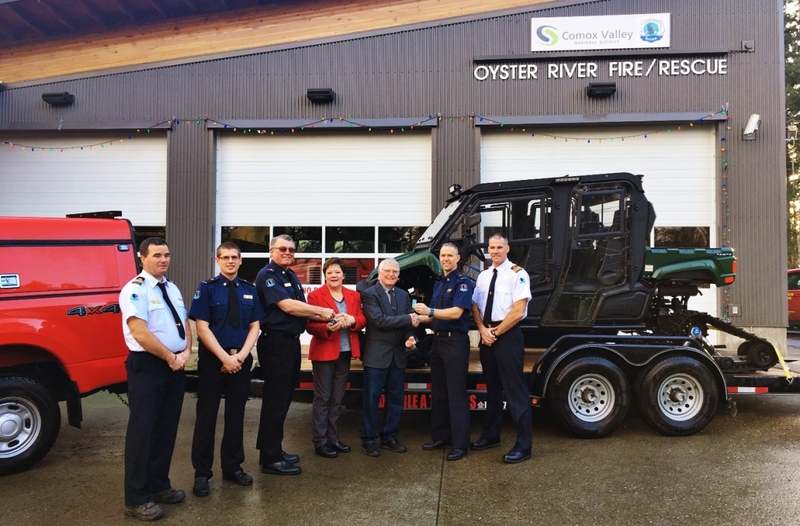 The other apparatus is a 2018 utility vehicle (UTV) which will be used in the Oyster River area during the summer months and is currently being used on Mt. Washington since winter weather conditions inhibit the use of the fire engine. The UTV will be used to move crew and trailer-mounted equipment to an emergency and will be located on the mountain each winter season. “Since Oyster River Fire Rescue provides fire protection to residents and property owners of Mt. Washington as well, it’s great to be able to utilize this piece of equipment effectively in both of these fire protection areas,” said Electoral Area C Director Edwin Grieve. “Our local firefighters earned funds through provincial deployments over the last two years, and they have used these funds to enhance their services throughout the region. Thanks to the Oyster River Fire Rescue Association for stepping up whenever people are in need of help,” said Brenda Leigh, Chair of the Black Creek-Oyster Bay Services Committee. Photo caption: CVRD Electoral Area C Director Edwin Grieve, along with Black Creek-Oyster Bay Services Committee Chair Brenda Leigh, receive the keys to the new fire services equipment purchased by Oyster River Volunteer Fire Rescue Association with monies earned from provincial wildfire deployments.